Raya Island or as some call it Raya or Raja Yai, is a paradise Island 18 miles due south of Phuket’s southernmost beach Rawai. 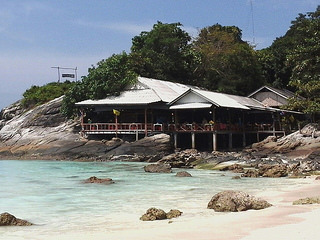 Racha Islands are comprised of two islands, Koh Racha Yai and Koh Racha Noi to the south. Raya or Racha Yai is surrounded by crystal clear waters and pure white sandy beaches the kind of sand that is just so fine it just melts through your toes. The island itself, is very popular with day trippers form Phuket, who come to dive and snorkel the beautiful coral reefs here. Only 10 guests on board our boat. The island also is very welcoming to those that wish to stay a night or two or maybe three. After the day boats have all left of Phuket, you can just sit back and relax and watch the sun go down in absolute peace and quiet. The island is well renowned for its idyllic peaceful lifestyle. And at night the island is still and quiet with only a hand full of restaurants and bars operating on the island. The beach is so romantic in the evening, as there is very little light coming from the island, so on a clear night, you can gaze up into the heavens for hours and hours, just lying on the beach admiring the constellation of stars in the night sky. The most popular beach on the island is northwest coast, is Ao Tawan Tok (also known as Bungalow Bay), which is located in a bay with many beach front Bungalows. There are several different places to stay on the island including places such as the 5-star The Racha also the world class resort of Rayaburi calls this place home. The main activities here are of course, scuba diving and snorkeling, which is possible throughout the entire year. Visibility on the gentle sloping reefs here, can reach as much as 30m, maybe even more. The marine life is quite spectacular too, there is an abundance of fish to see, including, Sea turtles, Stingrays, Leopard Sharks, Black Tip Sharks, Morays Eels, Barrcudas and Trevallies, even Nemo lives here. There is also some wonderful exploring to do on the island, the island itself has several bays and each is accessible with a little trekking. There is other wildlife on the island too, there are several species of birds, if you take the time to roam around (you cannot get lost) you may also bump into a Water Buffalo taking bath or maybe even a large Monitor Lizard or two, and if you are really lucky, you may see some harmless Tree Snakes. Most boats leave Phuket early morning to get out to Racha Yai, the speedboats tend to take approximately 30/40 minutes to get out there, where as the dive boats tend to take around 90 minutes or so. Most boats leave form the port of Chalong, which is in the southern part of Phuket Island. Raya Island is accessible throughout the year, however in the low season (green season), May to November, the sea can get a little rough out there, so sometimes (rarely) the speedboats can’t get out, so please check conditions before booking. There are many different packages available to tourists, whether you want to go for a quick half day tour or spend time just on a boat out there snorkeling or diving, or the resorts on the island are excellently placed and all have instant access to the beaches and bays. Only recently in the past couple of years has Raja Yai Island really become popular with overnight guests, it is still relatively unknown, but there is a little building work going on. So it may be worth going to see this pure paradise island before there are too many buildings on there. You won’t be disappointed, and you will come back so relaxed and chilled out you will wish you never left the place.